BOSSY BETTY: Grey Skies Are Gonna Clear Up--Right? We've had grey skies for about a week now here in normally sunny Southern California. Whoever took it away, really needs to return it soon. So what's a Betty to do? Go out on my usual walk, take my camera, and make the best use of that big grey canvas overhead. I love this giant tree. I think it likes me too. It waves to me when it's windy. 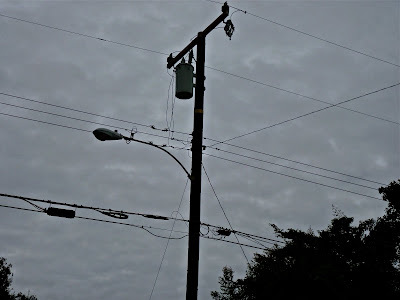 Sometimes if I'm lucky I get to see a squirrel on these wires. I am currently fascinated with TV antennas. They are endangered creatures around here. Don't tell HOB, but this may mean a hunting expedition in the future to capture more of these! He's my driver on such trips. These three are looking for the sun too! Bet they see it first! Hope you have blue skies wherever you are! I don't mind the gray skies. I kind of like them...keeps us pensive. It looks like they inspired you too Betty to take some cool photos. But never fear Betty...I am sure tomorrow will be just another sunny day in So. Cal!! Every time I see palm trees, I'm convinced I'm moving to a warmer climate! beautiful shots Betty! this the OC in SoCal...pulease! Still waiting for the sun. But...I am not complaining...I didn't care for the triple digits. Betty, those photos were spectacular! Here in Nevada, we are entering into our Winter. Everyone thinks it is always hot in Las Vegas, but we only have June, July, August and some times September as our hot months. October through February are COLD, even snow some times. March through May is gorgeous. I always enjoy the rain and cold days. I always feel more inspired. We have had a beautiful sunny week but now the clouds and rain are moving in. Our weekend is going to look a lot like your photos except no palm trees. 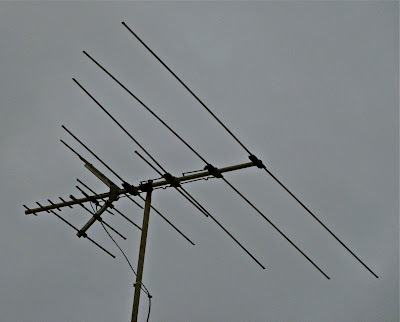 The TV antennas are getting rare, it would be interesting to see how many you can find. Spooky pics with the grey skies! We've had a mixture of grey, blue and white today. Looking forward to blue skies tomorrow. The last days in the Owl Box, in San Marcos, were rather rainy, too. Very appropriate for the end. Great idea to take those pictures!! They are great!! A. D'Angelo once said, "Wherever you go, no matter the weather, always bring your own sunshine." oh BB!!! Bring back TV Antennas!!! I absolutely detest my digital freeview black box rubbish thingy cos the signals are so bad I've lost all the channels I used to enjoy with analogue tv!! Boooooo to the black box!!! :-)Bring back analogue!! Ooooh I love your pumpkin blog pic header!!!! Grey skies in California?!?!?!?! Jamais!!! Oh but look how dramatic your pics are!! Wow!!! Hello to your tree and I hope you see lots of squirrels being all dextrous and gymnastic on those wires!! Me no likey grey skies either!! I need my sun!!!!! Yes antennas and laundry lines ar stalwarts of the past!! I rigged up a laundry line just to have it and remember. The pics you captured are marvelous. Grey skies or no...well done. Hope you get your sun back soon. I think South Carolina took your blue sky. A BIG THANKS!!!!!!! It's beautiful here! Blue Skies and SUNNY! PS ~ Ya, I think your right about the tree ;) I'd say it likes you. Love the last one! Hope your sun comes back soon. Hope your skies have cleared for the weekend! That IS unusual! My hubs grew up there and we visit there often. Never see a whole WEEK of gray. Ah well. Go to Disneyland and enjoy anyway. It just offers a different light to live in, but have spent an entire week in rain gear. I like it sometimes for macro.It rained 6 hours last night, hope to see some sun for my travels this weekend looking for fall festivals.Starting with a small church for homemade cinnamon rolls. Grey brings out the character of a place. Hi BB we expect you needed the rain just as we do. Very nice pictures even w/o blue skies. I love the cloudy days! And the rain! We have had a combination of weather here which isn't unusual for northwestern pennsylvania. I do see some blue in the sky out my window this morning though so it could be a very promising day. I can tell how much that first tree likes you! It's like he posed just for you. Blue skies here - but chilly. Already missing summer....have a great weekend Betty! It's so grey and gloomy out here - but we are kind of used to the storms passing through. Hope your grey skies turn sunny soon Betty and that you get the sun you are seeking! I like your Halloween header ~ cute! Gray skies are ok when you have someone sweet to curl up to. Your sunshine will return - until then, you be the sunshine! take your grey skies any day. Enjoy the weekend rain or shine.!! I love the antenna-hunting idea! So odd that some folks even still use the darn things. Cool idea to nab shots of them before they're extinct. I'm new here and love the place! I'll be back. Yeah, I remember January getting some clouds and rain, but not other months. Grey sky is our October - May weather. Insert very few sunny days here and there. I would make a comment, but I won't because I usually don't comment on posts that have a ton of comments already, sorry. But if I WERE to comment, I would mention that you took what would have been a boring situation and made awesome photos with them. That's so uncalifornia indeed, but it made me feel better. Where I am now has nothing but grey skies and red maple leaves. I giggled at the tree waving to you!!! Beautiful photos! Those were all great!!! I really like the header too! 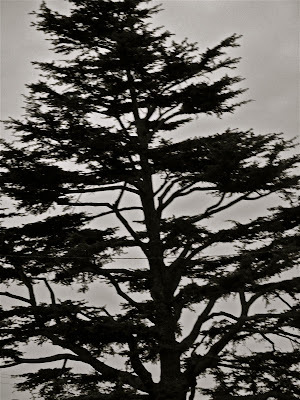 Any who, love the pictures - especially the picture of the tree waving to you. Clearly, it does like you. nice pics...antennas do havea nostalgic place...remember my dad on teh roof adjusting ours...hope the sun finds you! I like the sun too, mostly- I'm a summer girl; but grey skies have their charm too. I use indoor antennas for my TV's, no cable. Good post and photos. Your gray photos are SUPER! And they made me laugh! Thanks! I'm ready for some sun too. It's too early for the cool weather here. Happy weekend too to you! "Put on a happy face. Brush all the clouds and cheer up. Put on a happy face." Sure hope I'm not the only one who remembers those lyrics!! Love the pics, Betty!! You even make grey look good! Welcome to our London weather! :) That said, today the sky has been brilliantly blue. Hoping you get your blue skies soon! It IS gray where you are. Looks like here, minus the palm trees. Hope you have sunny skies soon. We're experiencing the Indian summer this weekend if we're still allowed to call it that. Beautiful. Nice to find the beauty in grey skies sometimes as well. 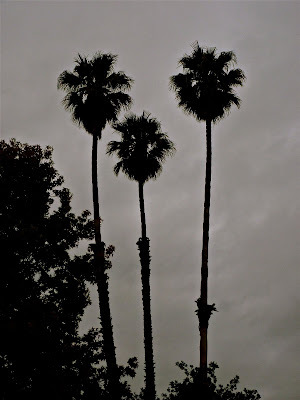 Palm trees with a gray sky background. Now that's unusual. We are having a deluge storm here today in San Francisco so don't feel bad. Those photos are awesome. I love the images of the trees. Grey skies with palms. Weird and cool all at the same time. I hope the sun comes out soon. It just makes a person feel better. Glad to hear your mister is coming home today. I always miss mine so much when he is gone. Love the pics. I'll take Southern CA. to that familiar odor of rotting leaves and fired up wood stoves heralding the arrival of Fall any day! I love these shots although like you I am ready for our usually sunny weather to return, the moisture has been good but the temps not so good--next week right? HEY!!! What happened to my sassy bird in the header?! I want that crazy bird back! PLEASE?! I'll trade you some blue skies! You sure did make 'gray' skies picture worthy! :-) I esp. love the antenna! Wish I still had one instead of my Dish bill most months. Haha..
Love this! Have a wonderful week! !